Angelo Que was denied outright lead of the Maybank Championship on Thursday after back-to-back double bogeys saw him slip down the leaderboard. Que made a stunning start to day one in Kuala Lumpur as he birdied nine of his first 11 holes, but he came into trouble at 15 and 16 and dropped four shots. His six at the par-four 15th was followed by a five at the next hole – a par three – and although he got one shot back at the last, he remained one behind joint leaders Marcus Fraser and Nacho Elvira. "I thought I was dreaming when I got to nine under after 11 holes," said Que. "But these things happen especially when you play well. You try not to think too much and get ahead of yourself by ignoring it and keep playing. But it sorts of plays on your mind too. "I got unlucky on 15 where I hit the fairway but didn't have a shot at the green. I got an unlucky lie and didn't make up and down. It was the same story on the next hole. Fraser and Elvira, who both started on the back nine, bounced back from bogeys at the 14th to claim a share of top spot, the pair both signing for 65 to leave them seven under. Both players benefitted from favourable scoring conditions early on Thursday, with Elvira picking three shots in a row from the 11th. Fraser was two under at the same stage before making gains later in his round to reel in Elvira, a 20-foot putt at the seventh a particular highlight. 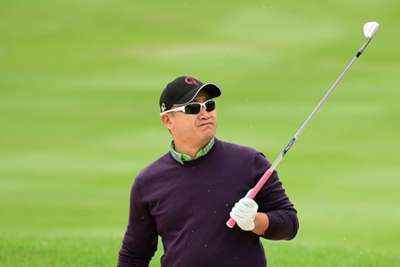 Matthias Schwab and Jazz Janewattananond sit alongside Que at six under after rounds of 66, while Belgium's Thomas Pieters is well placed on five under and veteran Ernie Els is a shot further back in an eight-man group.